Is Apple's HomePod Too Little, Too Late, to Catch Amazon, Google and Sonos? HomePod, the Siri-infused speaker Apple announced earlier this week at WWDC, is the svelte love child of a Sonos speaker and Amazon Echo, though Apple is leaning a bit harder in the first direction than the latter. 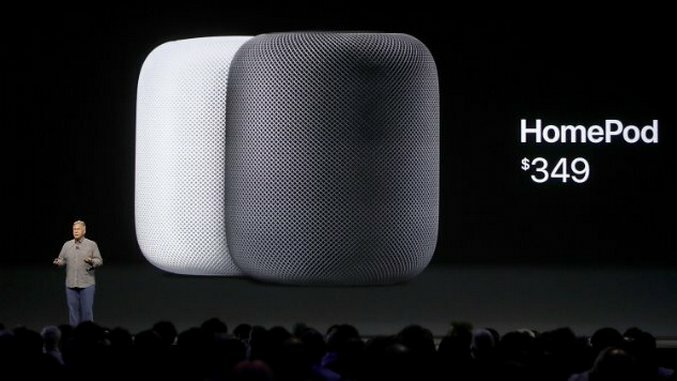 In announcing the HomePod, Apple led with the speaker’s premium audio capabilities and how it can network with other speakers to provide quality audio and music throughout a home. Checking a lot of the boxes people already love about Sonos’ speaker systems. And sure, there could definitely be room for Apple to come into that space and have some success. Buried at the bottom of the HomePod’s spec sheet is the Trojan Horse into your living room: Siri integration, which can do everything from set timers to help run your smart home gear. That’s not Sonos’ territory — it’s a shot across the bow at what Amazon and Google are doing with their Echo and Home ecosystems, respectively. But, has Apple stayed on the sidelines too long — and introduced a project too split in its focus — to actually break into this market with any real success? Apple has made it clear the HomePod is being positioned as a piece of audio gear first and foremost, with everything from seven horn-loaded tweeters, a six-microphone array for listening, and some room calculation tech designed to tweak the acoustics depending on room size all jammed into a relatively small package. Early buzz indicates the audio is pretty great, and with a price point of $350, it better be. Because the HomePod costs a whole lot more than any of its particular competitors. Regardless of category. Depending on the model, you can pick up an Amazon Echo anywhere from $50 to $230 (with the Echo Show, which comes complete with a screen, at the top end). The Google Home clocks in right at that same ballpark, with an MSRP of $129. If you’re trying to decide between a HomePod and Sonos speaker, a comparable Sonos can be had for $199, while you can get a much larger Sonos system for what you’d have to plunk down for a HomePod. If Apple is trying to unseat Sonos from the high-end audio market, it’s an uphill battle at that price. If the company is gunning for Amazon, you can literally buy seven Echo Dots and connect every room in your house with what it would cost to pick up one HomePod. For anyone looking to make their home a little smarter, that choice is a no-brainer. It begs the question: Is Apple positioning the HomePod as a piece of audio gear because it knows it doesn’t have the chops right now to compete on the same level as Amazon and Google in the smart device game? Apple may have pioneered the smart assistant with Siri, but Amazon’s Alexa can run laps around it at this point when it comes to being an in-home assistant. Amazon has been building up a library of thousands of skills for a few years now, and Alexa gets better and more useful every single day. Google Home is also slowly improving and playing catch-up. Meanwhile, Siri is making its first foray into a living room piggybacking on a high-end speaker. That’s not to say Siri can’t get there, but asking $349 for what is arguably a less-useful experience is a tall order, even for the most ardent of Apple fans. For that price, you could pick up a Sonos speaker and a couple of Echo Dots — and still have some cash left over for a nice dinner, to boot. Apple is lying to itself if the company really believes the HomePod can just be a streaming speaker. You don’t put Siri in it without the foresight for what that means in a larger context, and you don’t make it smart home compatible for the same reason. This is Apple’s first shot at a device that could potentially manage your home and embed itself into your life in a way your smartphone can’t — and in that respect — it underwhelms. This is a product straddling two categories, and not in a good way. It’s at the very expensive end of wireless speakers, and at the weaker end of the spectrum when it comes to smart home devices. Apple already tried to sell users a high-end speaker with the short-lived Apple iPod Hi-Fi, and it did not go well. Amazon basically created the smart speaker market by selling around 10 million Alexa devices to date. That’s one hell of an ecosystem to birth from thin air. Google is also building its own install base with Google Home, but Amazon is proving to be a strong leader, even with the competition brought on by a major player like Google. And sales are only expected to climb in the coming years. Ambient computing looks to be a huge market, and there have been rumors for months that Apple was getting in the game. You’d think the company would be falling over itself to establish a foothold in as many living rooms as possible, right? Put simply: A $349 speaker that puts Siri in the backseat is a strange product to lead that initiative, especially when people are snapping up Echo Dots in three-packs that are still less than half the HomePod’s asking price. Apple has shown an interest in getting in on the smart home business, baking smart home functionality into iOS and even developing its HomeKit platform to guarantee compatibility with the iPhone. At the time, it seemed like that was actually leading to something. Now? It’s hard to say. Amazon’s lead grows bigger by the day, and with its platform-agnostic approach, it’s going to be hard for Apple to make up that ground when the HomePod finally goes on sale at the end of this year. Plus, Google has been fighting hard to lock up the No. 2 spot in the market. Apple will enter the market behind Sonos in the speaker game; and behind Amazon and Google in the speaker game. At this rate, you have to wonder if that’s exactly where Apple might stay.